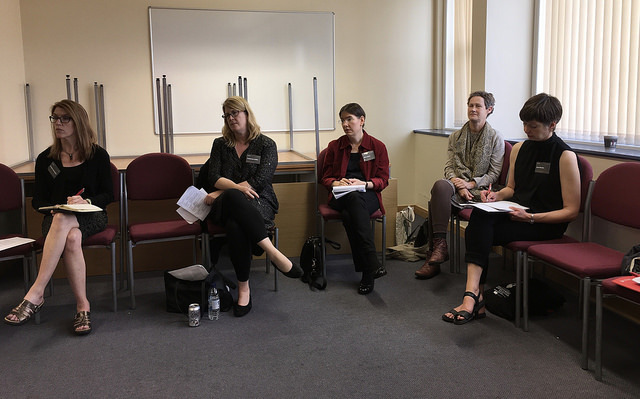 Georgia Johnston (second from left) shared her insights with the Woolf community at the 26th Annual International Conference on Virginia Woolf at Leeds Trinity University in Yorkshire, England last June. The Virginia Woolf community is mourning the loss of Woolf scholar and friend Georgia Johnston, a professor of English at St. Louis University, who passed away March 20. Georgia studied the cultures and literature of the early twentieth century. She was particularly interested in Modernist autobiography in terms of sexual theories of the period. Her 2007 book, The Formation of 20th-century Queer Autobiography, shows how autobiographical forms intersect with theories of desire. Her current book project, which was in progress at her death, was titled Modernism’s Civilizations. It focused on the moment when evolutionary deviancy cannot provide an adequate binary opposition for the meaning of civilization, with resulting changes in textuality, genre, and subjectivities. She organized and hosted the 1998 Woolf Conference at Saint Louis University. A memorial service is scheduled for 11 a.m. this Saturday, March 25, at Trinity Episcopal, 600 N. Euclid St., in St. Louis. Condolences can be sent to Georgia’s brother, Bill Johnston, care of the English Department, Saint Louis University, 3800 Lindell Blvd., Adorjan Hall Rm. 127, St. Louis, MO 63108. Dr. Georgia K. Johnston, Ph.D., 58, passed away Monday March 20, 2017, after a long battle with cancer. She is the daughter of Arthur Johnston (deceased) and Patricia Johnston, and is survived by her mother; her sister, Margaret Ohlenschlaeger, her niece Ellie Sigers and her husband Matthew, her grandnephews, Noah and Owen, and grandniece Emily, nephews Zack Overton, Andrew Overton, and Thomas Ohlenschlaeger; her brother, William (Bill) W. Johnston, his wife Susan, niece Katie Johnston; her sister, Elizabeth (Liz) Johnston Arbittier, her husband Douglas, nieces and nephews, Bonnie Arbittier, Jacob Arbittier, Rosie Arbittier, and Jonathan Arbittier. She is also survived by her long time companion Paige Canfield, and many dear friends. Georgia was a respected professor and scholar at St. Louis University where she taught for over 25 years. She loved, among other things, poetry, dancing, and trees. In honor of her memory, donations may be given to the Nature Conservancy, 4245 North Fairfax Drive, Suite 100, Arlington, VA 22203-1606. We share remembrances posted by friends and colleagues via the VWoolf Listserv, as well as one from an SLU colleague that was sent to her academic community. Georgia Johnston came to SLU in 1992 after graduating with a doctorate in British literature from Rutgers University in New Jersey. She was an internationally recognized scholar of modern British literature, specializing in the intersections between women’s writing, psychoanalysis, and constructions of gender. In addition to her work on behalf of the Department of English, Georgia was a tireless advocate for Women’s and Gender Studies at SLU. She served as the Women’s Studies Program’s director for two years, and mentored many undergraduate and graduate students engaged in the study of gender and literature. Georgia was an exceptional teacher, completely committed to her students and to the subjects she taught with passion and intelligence. 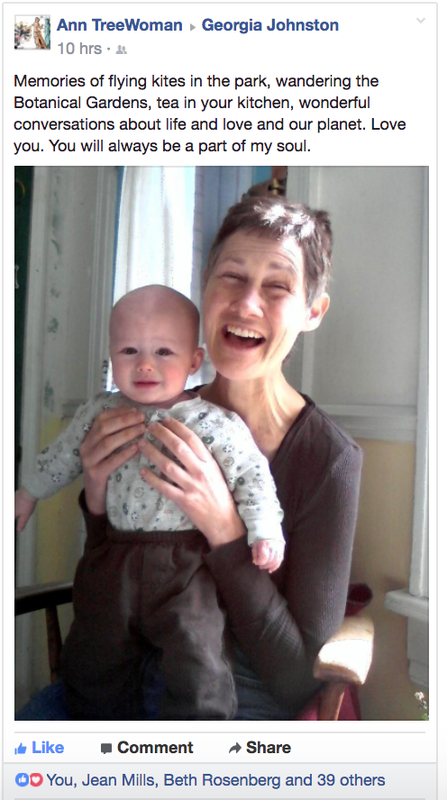 She was a particularly effective mentor for English graduate students. She was recognized by the department’s graduate students five years ago when she received the student award for Outstanding Faculty Mentor. Georgia has served the University in many other capacities as well, including Interim English Department Chair in 1999, and most recently, Coordinator of Graduate Studies in English. She will be much missed by the English Department, the University, and her many students. Georgia was a generous scholar and colleague and a beautiful, gentle, warm human being. She was interested, as Gill has said, in everyone. And where you taught, who you were, what you had or had not done never mattered to her. She was always, always warm and welcoming. Terrible news. Georgia was such a steady, thoughtful and generous person. She was interested in everyone and wrote so beautifully. I think of her as calm, composed and without egotism. I also recall her dry sense of humour. Such a shocking premature loss. Such appalling news. Georgia was wonderfully supportive and kind to me (and others). Another great Woolf scholar no longer with us. I am so sad to know this news. Georgia wrote an early and important chapter on Woolf’s essays that helped me conceive of my dissertation and which I re-read many times in the process of working on Woolf’s essays. I am still grateful and humbled by her grace and generosity when we met, decades ago. She treated me like a person who mattered when I was very young, unpublished, and feeling shaky. 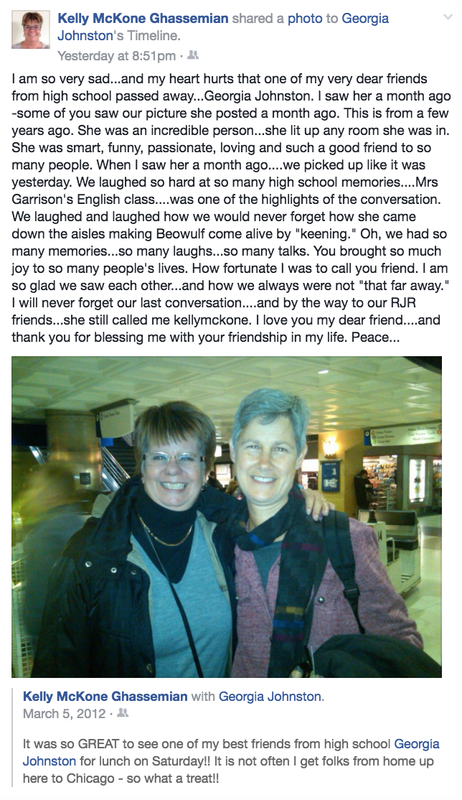 As many have said here, her kindness, care, and warmth were profound. She was a lovely woman. Very sad indeed that her life ended too soon. Such a good spirit and fine scholar. Remember the orphaned cat found at the end of the St. Louis Woolf Conference? Of course it got to live out its life with her! Shocking news. I join everyone who knew Georgia in quiet and personal grief, I remember her VWS Conference in St. Louis–the weather was awful–so much rain–so many flights cancelled or postponed. And she was admirably focused and unfazed by it all. She will be missed by us all. She was such a gracious colleague over the years and she and I often talked about ways to broaden the visibility of literature by women modernists. She conceived of a possible annual conference on early 20th-century women writers, which she thought should be held at Saint Louis University in 2017 but then she got too sick to follow through on this fine idea. At Georgia’s 1998 St. Louis conference, it was my friend June Dunn who rescued the kitten mentioned a number of times in the remembrances, further cementing my sense of connection with Georgia, though we did not talk very often. The remembrances of Georgia that have been posted are so accurate, so vivid. They evoke her so beautifully. Georgia was gracious and gentle, kind and witty, and always, always deeply wise. She was also wonderfully graceful. The angle of her head, her slow gestures, her smile, her elegantly subtle scarves, all glimmer brightly in my memories of her. Of particular intensity is my recollection of her calm and fearless way of coping with the cancer as if it were just a minor obstacle, a mere hindrance, a distraction which she seemingly confronted calmly and fearlessly in its various manifestations over the years. I first met Georgia in 1992 in New Haven at the second annual conference on Virginia Woolf, Virginia Woolf: Themes and Variations, the conference I had organized with Mark Hussey, Patricia Morgne and my then-graduate student Donna Risolo. I still remember the joy of talking to Georgia for the first time right at the end of the conference. The last time I saw Georgia was in Leeds at the 26th Woolf conference, Woolf and Heritage, where I was privileged to chair the panel on which Georgia presented her brilliant paper, “The Aesthetic Heritage of the Outsider.” Erin Penner (whose paper was “The Curse of War”) was the only other participant on our two-person panel. It was truly a great blessing to have only the two presenters. We had a good number of attendees and were able to have longer presentations, a very relaxed conversational experience and a really rewarding exchange of ideas. Indeed, the panel lasted beyond the full hour and a half. I am very deeply grateful that I was assigned to chair that panel especially since I was able to spend time with Georgia both before and after the session. It breaks my heart to know that I will never see Georgia again, and truly I cannot believe it. 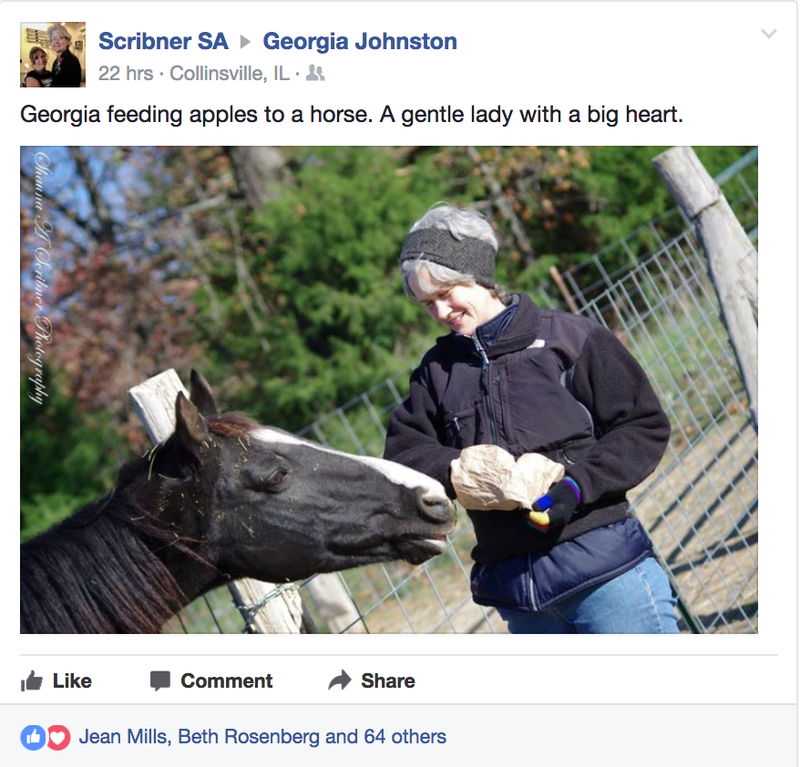 On Facebook, 47 friends posted comments and photos on Georgia’s timeline. Here are screenshots of a few that show some of the many sides of Georgia. We conclude with a quote from Woolf herself, shared by Kimberly Coates, who this week is teaching The Waves to an undergraduate class. 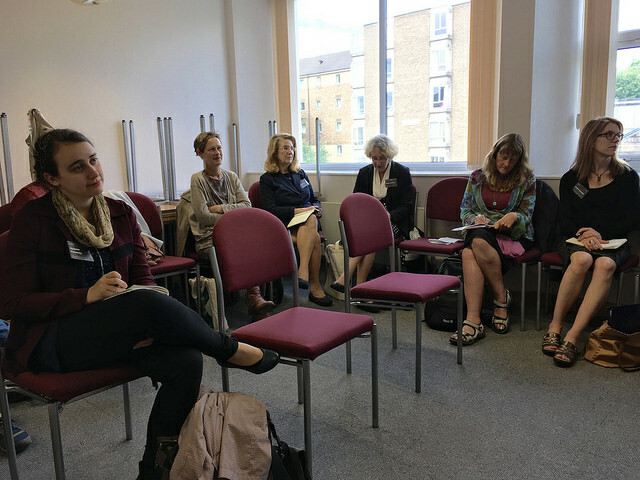 Georgia Johnston (second from right) dutifully attending a business meeting of the International Virginia Woolf Society during the Leeds conference last June. Shocking news for me. Georgia Johnston and I just exchanged emails last December, from which I learned of her illness. Never knew she would leave us so soon. I got to know her in 2010 woolf conference, and she expressed her wish to come to China if there was chance. I contacted her for this arrangement last December, only found out she was unable to come. She was such a lovely, generous and supportive person, always kind and witty as I remembered some of her talk.What a pity! What a loss!